Genzyme, a Sanofi company, recently announced novel positive 5-year experimental data from the extension study of Lemtrada® (alemtuzumab) in individuals with relapsing-remitting multiple sclerosis (RRMS). The findings were presented today, October 9, at the 31st Congress of the European Committee for Treatment and Research in Multiple Sclerosis (ECTRIMS) in Barcelona, Spain. Lemtrada® (alemtuzumab), developed by Genzyme, is a monoclonal antibody that binds to CD52, a protein present on T and B cells. It has been suggested that these immune cells play a crucial role in the inflammatory process that occurs during multiple sclerosis (MS). It’s not clear the mechanism of action of alemtuzumab, but it seems to work by depleting circulating T and B lymphocytes. Eventually the lymphocyte populations will reconstitute, however, this replenishment is variable and depends on the subtypes of lymphocyte . “The five-year data announced today are exciting and important for people living with relapsing MS” said Bill Sibold, Head of Genzyme’s Multiple Sclerosis business in a press release. 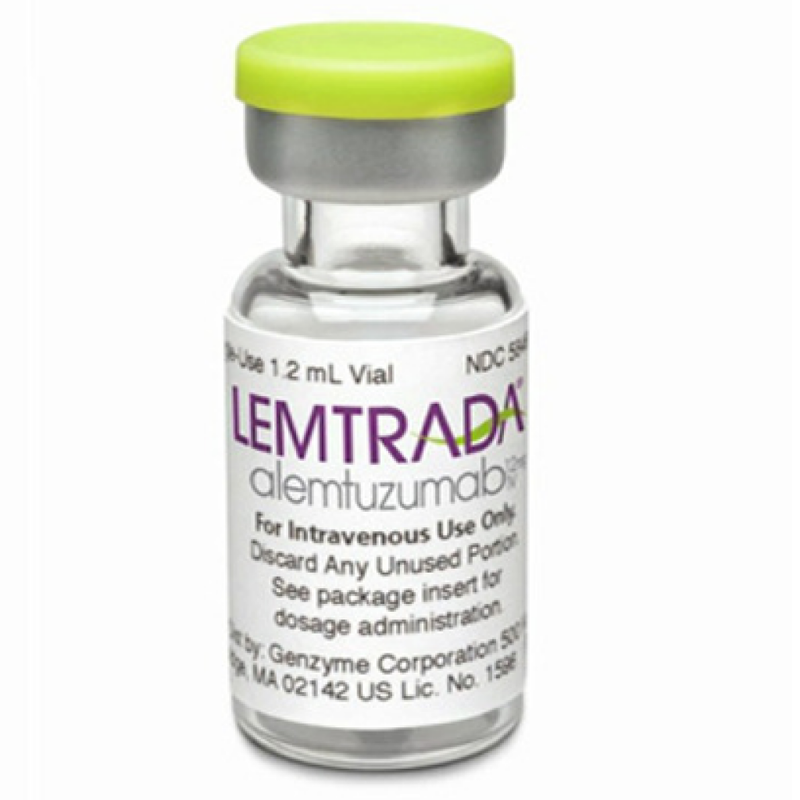 He added that Lemtrada is a potential alternative therapy for patients that suffer from MS. The Phase III trials for Lemtrada were randomized, rater-blinded, two-year pivotal studies. The studies compared Lemtrada therapy with a high-dose subcutaneous interferon beta-1a (Rebif®) in patients with RRMS with active disease that were either treated for the first time (CARE-MS I) or were unresponsive to another treatment (CARE-MS II). Both in CARE-MS I and II, Lemtrada was considerably more efficient than interferon beta-1a at reducing annualized relapse rates, however, there was no significant difference between the two drugs in slowing disability progression. In CARE-MS II, Lemtrada significantly decrease the rate of accumulation of disability when compared with interferon beta-1a. For the extended CARE-MS I and II, i.e. years three, four and five, patients had to have at least one or two relapses or new or enlarging brain or spinal cord lesions. During these studies, patients treated with Lemtrada showed low annualized relapse rates and had no evidence of MRI disease activity. Importantly, in the fifth year of the trials, 80% and 76% of the patients treated with Lemtrada in CARE-MS I and II, respectively, did not show aggravation of disability progression assessed by the Expanded Disability Status Scale (EDSS). Additionally, 33% and 43% of the patients with some disability before treatment in CARE-MS I and II, respectively, showed improvement in EDSS score. Also, the patients showed a decrease in brain atrophy. However, during the clinical trials, the therapy with Lemtrada induced serious adverse effects associated with infusion-associated reactions, autoimmune disorders (such as thyroid disease, autoimmune cytopenias, and nephropathies), infections and pneumonitis. “These data illustrate that most Lemtrada patients experienced sustained effects of treatment, despite the absence of additional treatment courses,” said Professor Eva Havrdová, MD, PhD, MS Center, Department of Neurology, First Medical Faculty, Charles University, Prague, Czech Republic. “It is encouraging to see consistent effects maintained across multiple meaningful outcomes through five years.” she added.